Considered to be one of the vital places in the house, the bathroom is rarely the size and look that people want and it can get frustrating for the ones who want more out of it. 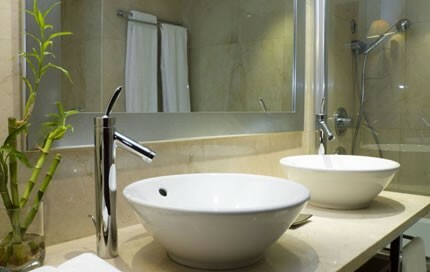 The truth is that most bathrooms in houses or apartments tend to be rather small and the space in it can barely hold all the necessary things. The only thing that the owners can do is come with ways to maximize the space and to offer that storage option without giving up on comfort. Each amount of space should be maximized by taking into account the following six steps which will help anyone who would like to remodel the bathroom and enjoy it as much as possible. Storing things is really important in the bathroom as there are many products which are considered to be indispensable. It is clear that they need to be placed somewhere and the best way to solve this situation is by installing shelves. Even if the space is cramped, the feeling of claustrophobia can be limited with the help of shelves placed at the level of the eye. They should be in the same color like the tiles or the walls. In this way, there will not be a sense of deepness when it comes to the shelves. If a person needs more space the deep shelves should be placed somewhere high so they do not interfere with the feeling of a large bathroom. For the lotions, soaps and shampoos necessarily for showering, shelves made of wires can be installed with ease inside or really close to the bathtub or the shower. It is good to go for corner shelves because the look will be spectacular and also the space provided by them is more than enough. Another solution to having as many shelves as possible is with the help of the closed cabinets. There will go above spaces which are not that used, for example the toilet tank. Some will prefer the old fashioned medicine cabinet. It will offer all the space needed and it could be used to deposit all sorts of medications and things that should not be easily accessed. In case that there are children in the house, this medicine cabinet is great because it has a lock to prevent them from reaching the drugs. Inside the cabinet, the shelves should have various heights. In this way items of all sizes will be hosted inside with ease. When planning a bathroom it is important to decide between the bathtub and the shower. Most people will love to enjoy a bathtub, but if the room is small this is not a great idea. Actually a tub might not be as necessary as it seems because a shower can do the job perfectly fine. If, by any means, the owner wants a tub, he can decide for a corner tub or one below five feet in length. Out of looks considerations many people will jump and buy a freestanding shaped sink. This should be avoided and a sink with a counter should be preferred. The sink should not be placed right in the centre of the counter because this way, there will be some space freed on it and it can be used to deposit things. It is a great idea to have a cabinet installed below the sink. In this way the space will deposit other important things for the bathroom. The toilet should be as close to the wall as possible. The model of the toilet should fit perfectly in the bathroom and should match the whole size of the room. If someone is looking for comfort, then the round bowls should be avoided. However, the round shape will go better in a smaller bathroom. For the ones who want both comfort and space they should choose the elongated and compact bowls. There are many ways to keep all the things in their right place. With the help of hooks, rack, hanging caddies and dispensers all the additional materials will get their place without having to occupy the entire bathroom. Everyone can improve the way that their bathroom feels while following the above not so expensive manners to make it look spacious and enjoy the time spent in it. In the end, it is in everyone’s power to turn a house into a comforting home. Steve Hanigan is a DIY enthusiast. He is a self taught home improvement expert and is currently working with Better bathrooms who are known for their vast collection bathroom accessories.